A third person was also rescued from the mountains with a suspected broken ankle. 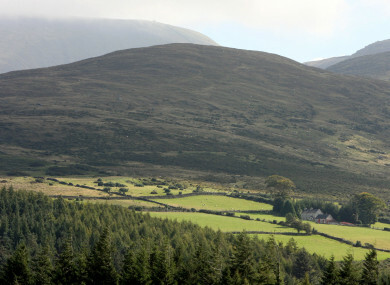 TWO PEOPLE HAVE been killed in separate incidents in the Mourne Mountains this afternoon. The Police Service of Northern Ireland confirmed the deaths of two male walkers in the mountains today. Shortly before midday, police received a request for assistance after a male was reported to have fallen while walking on Wee Binnian, around 20km from Newry, Co Down. A second request for assistance was also made after a male was reported to have fallen while walking on Slieve Commedagh, the second-highest peak in the mountains located around 25km from Newry, shortly before 1pm. “Police and other emergency services responded but unfortunately both men died at the scene,” Inspector Frances McCullough said, adding that their deaths are not being treated as suspicious. A third male was also rescued from the mountains with a suspected broken ankle following a fall close to the Saddle at around 2.30pm. Email “Two hillwalkers killed in separate incidents in Mourne Mountains”. Feedback on “Two hillwalkers killed in separate incidents in Mourne Mountains”.